Whitby RUFC kicked off their Durham & Northumberland Division Two season with a home victory over Ashington. The hosts were missing captain Gordon Bland and sibling David, and also face the first half of the season minus influential flanker Anthoney Craig. Aaron Jones passed a late fitness test to take his place in the centres in a youthful-looking starting XV. The game started with both teams testing each other out, and the young Whitby pack, led by James Newton, more than held its own at the set piece against their more experienced counter parts. The Maroons forwards’ hard work was soon rewarded when number eight Jack Braithwaite went charging through to open his and his team’s account for the season. Stu Gregson added the extras for a 7-0 lead. Whitby continued to press their visitors but were caught napping when an Ashington back row slipped through the home defence to score a try that was all too easy. Coach for the day Matt Webster galvanised his young team who responded positively and kept up their high tempo rugby, which the visitors were struggling to cope with. With a penalty awarded under the posts, Stu Gregson duly returned three more points for his team. However, just before half-time Ashington forced their way over the line to grab a converted score to make the score at the break 12-10 to the men from Northumberland. The second period began with Whitby applying more pressure on the Ashington line, but it was the visitors who were to score the first points after the resumption with a neatly-struck penalty that moved them five points ahead. Despite the scoreline, the Maroons continued to play their expansive brand of rugby. With full-back Gregson knocking the ball close to the Ashington try-line, the chase was on and a scramble for the ball ensued. The referee spotted an act of foul play that deliberately stopped Whitby from scoring the try and had no hesitation in running between the posts and awarding a penalty try which Gregson converted to put his side two points ahead. 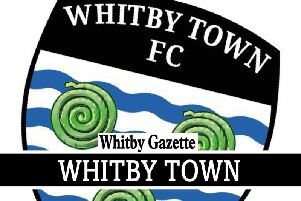 The game continued with Whitby continuing to grow throughout the 80 minutes and having plenty of ball. Their young pack continued to impress with Hare, Bruce Reed and Nathan Kaz leading from the front. Veteran Ollie Roberts was rolling back the years with some fine running angles and winger Guy Taylor also made plenty of metres for his team. The Maroons eventually stamped their authority on the scoreline with two neatly-taken penalties by Gregson, giving his side a two-score advantage. The last play of the afternoon saw a moment of solo brilliance from stand-off Sam Webster. He side-stepped his way through the Ashington defensive line to gloss a fine performance, with Gregson completing a 100 per cent kicking afternoon with the conversion for a final score of 30-15 to Whitby.